There is so much Disney magic packed into a Disney SMMC (Disney Social Media Moms Celebration) trip that it’s hard to pack it all into a re-cap, so I’ll be sharing many more posts about our time at Walt Disney World Resort and Disney Cruise, but I wanted to give all my curious readers out there a re-cap of Disney SMMC 2018; what it is all about, what we did on the trip, and what you can expect to happen on this Disney SMMC trip. First Off: What is Disney SMMC? Disney Social Media Moms Celebration is a trip that Disney hosts once a year where parent bloggers (both moms and dads) are selected to go on this trip. In years past, it’s been a Walt Disney World Resort trip, and some years a combination trip of Walt Disney World and Disney Cruise Line. No one is 100% sure how they get invited, but one thing is for sure to get you on the path of getting invited if you’re a Disney SMMC hopeful: Keep blogging, keep doing what you love, be true to yourself, and never give up. I just never stopped dreaming and working hard, and it paid off! During Disney SMMC trips, you not only get to experience Disney vacation magic with your family, but you also get to attend conferences with guest speaker who provide you inspirational stories and great tips in furthering your brand, as well as crucial tips to social media practices and staying on trend. As I write this, I have two more days left of my trip and I already feel so inspired and rejuvenated to grow my blog and brand, while staying true to myself and the topics I love. For Disney Social Media Moms Celebration, we stayed at the beautiful Coronado Springs Resort. The hotel surrounds a large lake, with many lake view rooms available (where you can also see the fireworks from). The resort I found is beautiful for a morning jog, with it’s picturesque trails, I saw many runDisney participants practicing in the morning. Coronado Springs also has a spa and gym you can enjoy while on property. There is a convention center at the hotel, which makes it a popular resort for convention goers, and also means it’s filled with restaurants and bars to enjoy within a short distance. There’s a cafe where you can get specialty coffees and pastries, waterside bars, poolside bars, and the table service restaurant Maya, which had incredible fresh guacamole and margarita flight. The rooms are newly, with plenty of charging outlets, a large flat screen TV, and removable shower head with lots of bathroom counter space and closet storage. On day one, we had a welcome dinner with Pixar friends, to celebrate all of the upcoming Pixar attractions, including: Pixar Pier (Disneyland Resort), Pixar Fest (Disneyland and Walt Disney World Resort), and Toy Story Land (Walt Disney World Resort and Shanghai Disneyland). The buffet dinner was fantastic, and my daughter loved getting to meet some of her favorite Pixar pals in an intimate setting. On day two, we had an early day (6:30am to be exact) to experience Animal Kingdom’s latest addition, Pandora: The World of Avatar. After hearing so many friends rave about Flight of Passage, I couldn’t wait to get on the ride. Flight of Passage definitely lived up to the hype, and I can say it is by far my favorite Disney ride of all the parks. The technology the Imagineers poured into the ride is incredible, where guests can feel a level of freedom like never before. We also rode the Na’vi river ride, which is an attraction all ages can enjoy, and also includes one of the most advanced animatronics in existance. I was in awe of how immersive The World of Avatar was, and made me even more excited for what Disney will be able to do with the Star Wars franchise with the upcoming Star Wars Galaxy’s Edge at Disneyland and Walt Disney World. Later that day, we were able to interview the art director of Walt Disney Imagineering Ryan Wineinger about Toy Story Land coming to Disney’s Hollywood Studios. The next day, we had a day of motivational speakers, and exciting Disney Parks announcements. We even had the pleasure to hear breaking news updates from Bob Chapek, the chairman of Disney Parks and Resorts. Some of the breaking news we heard was about the Star Wars Hotel, which will have windows looking out into space, and give guests the opportunity to wear costumes for a completely immersive vacation experience. We also learned that what was previously Cove Bar at Disney’s California Adventure will be re-themed Pixar, called Lamplight Lounge. Later on, we had exclusive sneak peeks of Disney’s upcoming film line-up A Wrinkle in Time, The Incredibles 2, and Christopher Robin. (Which all look fantastic, but I must say I’m most excited for Christopher Robin). The rest of the day was left for us to have fun in the parks with our families. For days four through six, we set sail on the Disney Dream, one of Disney Cruise Line’s largest ships. On the first day, we had a welcome reception with the fellow attendees, where we did Disneybounds inspired by Disney Cruise Line, Aulani, and Adventures by Disney. After the reception, there was dining at Enchanted Garden and The Golden Mickeys. My daughter was a little sleepy, so my family and I watched The Golden Mickeys from our stateroom TV and took advantage of the room service that’s included with your cruise for a little family R & R.
The next day was another fun day of Disney conferences. One of my favorite speakers was John Breckow, who is the director of Disney Corporate Citizenship for Disney Parks & Resorts. He told us inspiring stories about how Disney works to help bring join to the community, hospitals, and Make a Wish everyday! It was inspiring to see how much magic Disney strives to bring to people throughout the world, and how much they give back. Another highlight was hearing from Her Universe founder Ashley Eckstein. She told us the story about how she was a childhood Disney fan, then later grew up to be an actress (including the Disney Channel series That’s So Raven and Ashoka on Clone Wars), to developing a geek chic apparel line called Her Universe. Since I aspire to make healthy living fun for families, and make people aware of all the ways Disney can accomodate those with special dietary needs, she is an inspiration on how you can turn your passion into your lifelong career. 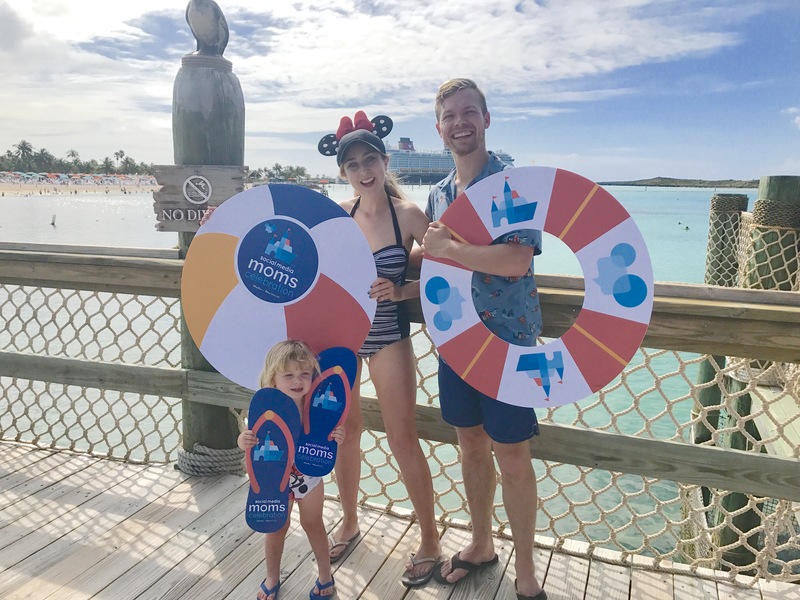 After the conferences with countless inspirational speakers, we had a leisurely yet adventurous day at Disney’s private island Castaway Cay, one of the ports of call in the Bahamas. I had never before visited beaches with such clear waters. With a shallow bay and no waves, it made for the perfect place to enjoy the beach with a toddler! Not to mention, it was pretty special that the island includes dance parties with Mickey and the gang too! Receive breaking and upcoming news about Disney Parks around the world, along with Disney Cruise Line, Aulani, and Adventures by Disney. Hear speakers who work at different divisions of Disney, to see what magical things Disney is making happen behind the scenes! Make life long blogger friends, and meet bloggers you may have previously only known online! Hear presentations that will give practical tips and info on blogging, social media, and keeping up with current internet trends. Experience new things happening at Walt Disney World and Disney Cruise. Hear motivational speakers to help encourage you on building your brand while also making time for fun and family. Most importantly, take time away from work to enjoy being on a magical Disney vacation with your family!